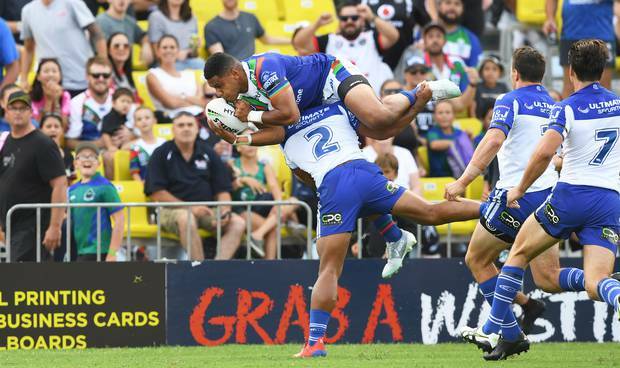 Warriors coach Stephen Kearney wants an overhaul of the NRL's rules regarding mid-air tackles — and is confident that a solution can be found. In the wake of a potentially nasty incident involving Warriors winger David Fusitu'a on Saturday, which could have resulted in a serious injury, Kearney is agitating for change. He has been in dialogue with the NRL over the episode, and will ask for a "please explain" from the head of referees Bernard Sutton. The governing body has confirmed that the official got the call wrong on Saturday, but Kearney hopes more can be done. "I've emailed the footage and my concerns over the tackle," said Kearney. "I'm looking to talk to Bernard Sutton to get a bit of clarification. They have already emailed me back to say it should have been a penalty ... so it raised a concern and they are addressing it. I'm sure they will make the appropriate changes if need be." Midway through the first half of the Warrior's 40-6 victory over the Bulldogs, Fusitu'a leapt high to reel in a Blake Green cross field kick. His opposite number Christian Crichton didn't contest the kick, but took out Fusitu'a legs while he was still in mid-air, flipping the Tongan winger, who only narrowly avoided landing on his head or neck. The NRL's rules offer protection to defending players jumping to take an opposition bomb — they can't be touched if off the ground — but none for attacking players soaring after their teammate's kicks. "It's common sense," said Kearney. "Particularly when you are catching you have no real protection when you are looking at the ball the whole time and in the position David was in." To illustrate his point, Kearney contrasted the punishments handed out to Matthew Lodge (Broncos) and Addin Fonua-Blake (Manly), who have both copped suspensions after taking out kickers. "There were a couple of guys on the weekend that were [suspended] for attacking the legs of the kickers," said Kearney. "But kickers are often readying for kick pressure but a catcher finds it a lot more challenging. "But [they] got two weeks each for attacking the legs on the weekend. What's the difference? That's a deterrent. "What's going to stop them? A penalty. I don't know if that is going to stop someone attacking the legs. It is an issue that is being dealt with now and I'm sure it will be dealt with in the appropriate manner by the NRL." Kangaroos winger Dane Gagai supported Kearney's sentiments. "Obviously it's within the rules and we're allowed to do it," Gagai told Australian media. "But as an outside back and going up for those balls it's a bit of a 50-50 thing. It should be looked at before something really bad happens." Fusitu'a didn't train on Tuesday due to a sore back but is expected to play on Sunday. Despite the manner of the win — the Warriors' biggest round one victory in their history — Kearney was more concerned with evolving than platitudes, ahead of Sunday's clash with the Tigers. "[There is] always room for improvement," said Kearney. "We wipe the slate clean and start again. It's not hard to find areas to be better and individually we can find areas we can be better."